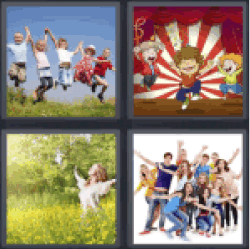 4 Pics 1 Word Group of children jumping. Kids cartoon. Happy woman on nature. Group of friends with arms raised. Thanks for visiting 4-Pics-1-Word.com, here are the cheats for your favorite game. 4 pics 1 word group of children jumping. Kids cartoon. Happy woman on nature. Group of friends with arms raised.